Each year I grow more and more frustrated that time seems to pass so quickly with so very little artwork done. I suppose its only natural for an artist, when new ideas and burning creativity consumes from within desperate to find its manifestation on canvas, or paper. And as the years go on, and time seems to be ticking closer towards the great unknown, that frustration only grows deeper. And yet, as I look back upon the last year’s work, I cannot say that the year was unproductive. On the contrary, a glimpse over my creative output demonstrates a fair breadth of artistic endeavours, and shows that besides the obvious application of time spent enjoying the incredible Mediterranean surroundings in which I am now living, I also applied myself to expressing those visions in a concrete illustrated form. Chief among my works for 2015 have been gouaches painted on paper. Perfect for their ease of use and the speed of their execution, I painted more gouache than any other paintings because they gave me moments of relaxation in between the pressures of work, and enabled me to quickly express my reaction to a new landscape or experience without lingering for months on a forever unfinished canvas. Asides from adding new interpreted landscapes to my Interpretations collection, I also created a new collection of portrait-format gouaches painted of the eight views enjoyed from the eight balconies of our Palma old town apartment. And it’s a good job I did, for no sooner had the collection been completed, we moved out! Of course my wedding and the honeymoon which followed were not only the central point of the year, but provided their own inspiration, not least at La Colombe d’Or hotel, where we were lucky enough to dine surrounded by original works by the likes of Leger, Braque and Picasso, and sunbathe under the wings of an Alexander Calder mobile. 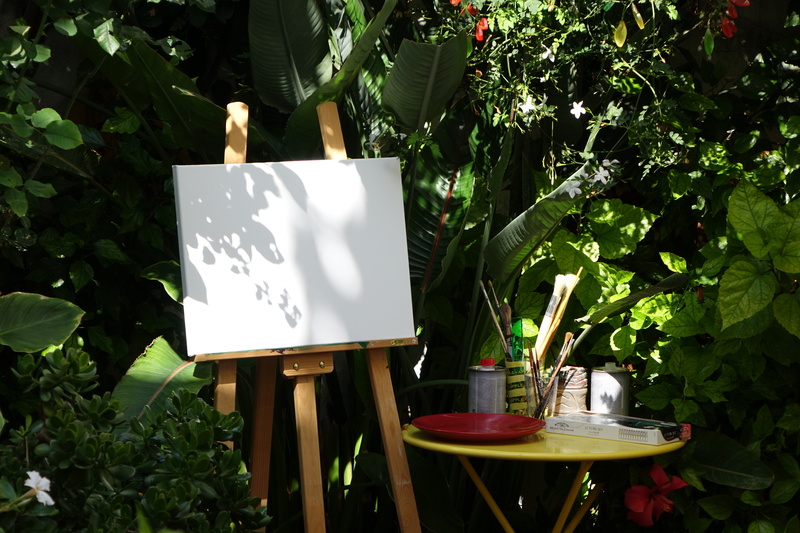 With only my small box of gouaches with me, I set about painting each of the rooms of the three hotels we stayed in, as well as the stunning leafy garden of the Colombe. It was also a good year for Commissions, and apart from the wide variety of works created for my employer, a few outside commissions also enabled me to paint these works which made it into the press across Mallorca and beyond. Taking a break from all the colour, 2015 was also a bumper year for my travel sketchbook. Started the year before, it is now almost full to the bursting with sketches completed this year including landscapes from across Mallorca, the French Riviera, Ibiza and Marbella. And finally to what, perhaps, I do best – the mighty projects on canvas; oil paintings each of which take weeks if not months to complete, but whose realisation is all the more fulfilling because of the time spent. I painted very few completed works on canvas this year, but those which reached the finish line were mainly Mallorca based landscapes, my ultimate challenge being the 1.5m landscape of the Bay of Palma. A true achievement for the year 2015. And now, as I look forwards, with three large paintings already on the go, and a whole new sketchbook ready to be filled, I cannot wait to see what the next year of creativity will bring. Dark, broody, flames flickering through a purple and chocolate brown backdrop…a portrait on the wall is alive. Dressed in the guise of a toreador, it is my self-portrait, part alarmed, part anxious, as I consider conflict in my life… the ever omnipresent concerns which come of big changes and repercussive decisions, a conflict which is played out in reflection in a Spanish bull ring; the steady workmanship which comes of intricately embroidering the matador’s traje de luz being the catalyst of the conflict, as blood pours from the pin which pierces at the heart of the bull. Set in the context of Andalucia, where I was when I painted the piece, this is the work of An Englishman in Andalucia… when my displacement in Marbella triggered a time of contemplation, when internal thoughts just poured onto the canvas. In the midsts of expressing my preoccupation of the time, I was inspired to utilise the Spanish corrida as my protagonist, having passed a bullfighting poster on my way to the beach. From that second onwards, this painting sprang into mind as I lay on the beach, and that afternoon I rushed home to start work on the piece. It is a painting which deals with the contrasts and conflicts which are always present in my life. The fact of being English and living in Spain, the repercussions of pursuing a creative career which inevitably meant the sacrifice of another. It is a brooding contemplative piece, but for me its creation made for a satisfying process. And in so far as its motifs are therefore consequently dark, the effect of painting it was to fill my mind with clarity and light. 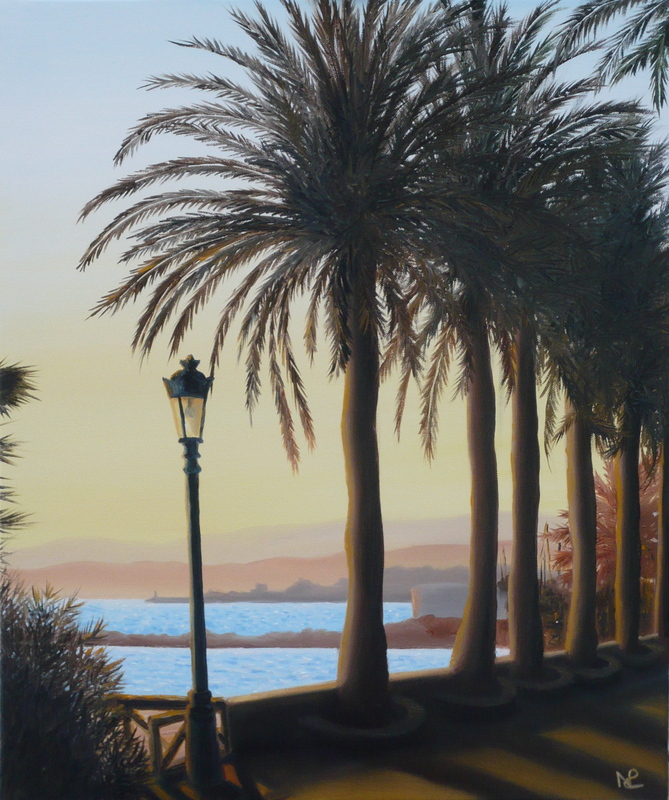 I interrupt my weekly digital exhibition of gouaches in my Ocho Balcones collection to present, with a considerable degree of excitement, my newest oil painting: The Bay of Palma. Started back in April when I found a typical little postcard of this typical view of the sprawling bay of Palma de Mallorca, I couldn’t resist the temptation to paint this city I have so come to love on the largest scale possible. So starting work on an immense 152 x 101 cm canvas, I set about painting what must be one of the most complicated painting projects of my art career. Just the cathedral alone took endless hours of laboured work and adjustments of proportion, let alone the city which surrounds it and then those dreaded boats. Ah the boats… how I agonised over painting these seemingly innocuous white forms, correcting shadows and trying to paint masts with a shaking hand. But once 205 of them were done, I stood back in pride and admiration at what I had a achieved: a landscape which is both a typical view of this most admired of cities, but which was nonetheless technically difficult to capture, both because of its size and its detail. But I am delighted with the result. I am therefore proud to share this painting exclusively on The Daily Norm along with a few shots of some of the many details which fill the work. I hope you like it! Last Friday I was thrilled and proud to have one of my paintings featured on the front cover of the food magazine supplement of Diario de Mallorca, the island’s principal daily newspaper. The work was painted especially for the monthly supplement, which included a special feature on chiringuitos, the uniquely haphazard little beach cafe-grills which pop up all over the island on some of the most hard to reach beaches and calas and serve up the freshest fish to those lucky enough to reach them. But my painting represents more than just chiringuitos, although it features two, one precariously balanced on long spindly legs, and the other nestled against the side of a pile of rocks. This painting is also my homage to Mallorca, with a backdrop of the famous blue and white lenguas material which has been a protagonist of traditional Mallorquin design for centuries, and with a rocky beach setting closely resembling the kind of mysteriously surreal craggy rock forms which characterise Mallorca’s consistently surprising rocky coast. Returning somewhat to my more surreal style, but injecting a fresh whiteness which I have not exhibited much in previous works, this feels like both a welcome reprise of a favourite style, and a new departure onto artistic pastures new, and in all things a devoted homage to the island I now love to call home. I have become enchanted, some might even say obsessed, with the landscape of Mallorca. How could I be otherwise? I have the advantage of living in one of the most perfectly compact, incredibly diverse and utterly breathtaking naturally beautiful islands in the world. From crystal clear waters on fine sandy beaches, to mountain ranges so sensational that they have been protected by UNESCO, Mallorca is a pure paradise of landscapes, and a world apart from the beach babe reputation it gained over the years. Unsurprisingly, as an artist newly arrived in Mallorca, I have an incredible thirst to paint the land around me. No wonder that I have some 5 paintings currently on the go in my light-infused studio which is blissfully big enough to allow so many projects to proceed at any one time. And the latest to achieve completion, and now my second major oil painting of Mallorca since my arrival at the end of last year is this one: Orient. Based on the stunning scenery of the Tramantana mountains amidst which I was lucky enough to spend a working week back in January, this painting depicts one of the breathtaking views I encountered. So utterly perfect because of its symmetry and its central view of one such beautiful mountain, this view reminded me of the landscape near Aix-en-Provence which has the Mont Sainte-Victoire at its centre, and which so fascinated Cezanne that he painted countless renditions of it. Similarly enchanted by this view, I never had any doubt that I would apply it to canvas, and here is the finished result. Now I can’t wait to complete another. It only takes a mere moment for your life to change forever. December 2012 taught me that much – a life obliterated – or May 2008 – when another’s mistake had irreversible consequences for the rest of my days. Yet if those moments of change taught me anything, it was that life is too short to stay where you are comfortable but unhappy, where monotony sets in and where you feel as though your train is trundling steadily up the wrong path. Earlier this autumn the chance to change paths and find happiness in change occurred to me very suddenly. It only took an email to set the new track in motion, and only two weekends for a decision to be made. For it was in those two weekends that I both attended an interview that would take me on a new path, and in which I made the ultimate decision, standing at the crossroads, that this new path was right for me. Two weekends: Thinking of Cappuccino is my newest oil painting, and it tells the story of how my life is all about to change: how I have accepted the offer to become Artistic Director of a global company bearing the name of Cappuccino and stationed within the sunny shores of Mallorca in Spain, and how in taking that offer it will mean moving from London, to Palma. 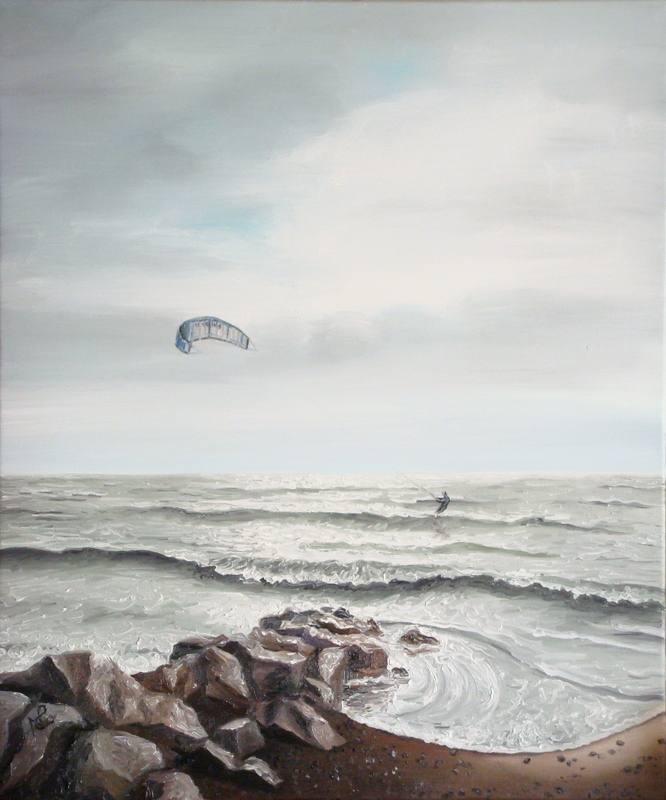 But the painting came to me in Italy, sitting by the seaside in Donoratico in Tuscany, home of my partner’s family. Sitting at a cafe by a sea so still it might have been a photo, with our own breakfast of cappuccino and crostata (jam tart) on the table, all we could think about was a move to Mallorca, despite breathing the pine tree perfumed air of Tuscany, and drinking in the beauty of that Tuscan beach before us. The obvious symbols came to mind: the lifeguard’s hut was the new sanctuary that a home within the medieval streets of Palma de Mallorca would offer us; through the window we looked onto the famous skyline of Palma seen behind the green shutters that are famous in both Tuscany and Mallorca. The lifeguard’s ring has given salvation to the artist within me, represented by the manakin sitting on the sand: it is not so comfortable a position as the crostata tart sitting securely on a blanket, but this tart is the law, and within the confines of its pastry lattice, the blood of my life and career development is congealed and imprisoned, like a soul left out of the fridge too long. I think it was in that moment, and in that second weekend of two, that we finally made up our minds to go, to take the leap of faith, to have an adventure and to change our lives. Now the move is in full swing, and by the end of this month we should be reinstalled in Mallorca. Which just goes to show that life can change in a moment. Despite many years of painting, drawing and (most recently) printmaking, and just as much time treading the boards of art galleries around Europe, I have been guilty of a great crime: I forgot all about still lifes. Subconsciously I have somehow discounted them, despite knowing them to be a great staple of art history and art collections around the world, and having enjoyed still life masterpieces such as Cezanne’s various compositions of oranges and apples, and the brilliantly photorealistic depictions of bouquets of flowers and lavish feasts from the Dutch golden age. Yet when I went to the Joaquin Peinado museum in Ronda last month, what really struck me above and beyond the majority of his wonderfully original cubist-inspired paintings, were his still lives. 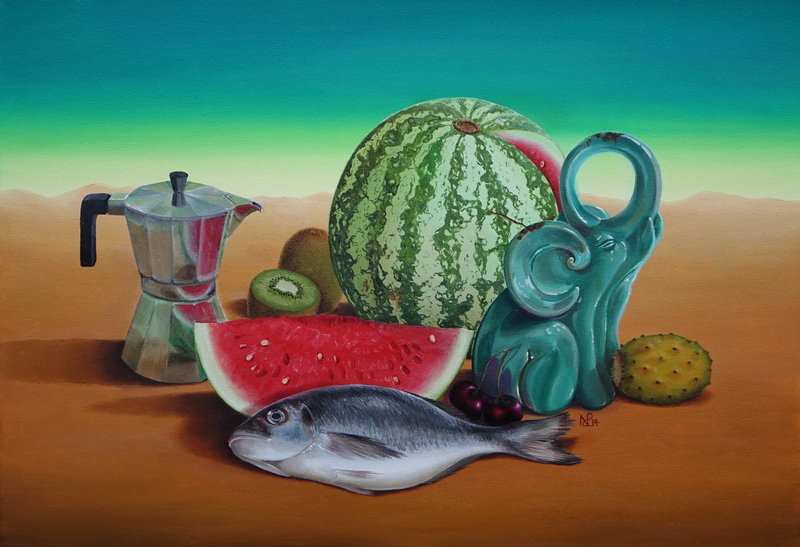 In particular I noticed his deceptively simple depictions of fruit and the odd household item such as a coffee pot, and an idea struck in my head: why don’t I paint a still life?! By coincidence, before we left for Ronda from Marbella, I had already begun an oil painting – a surreal looking desert landscape which was to be the base of another germ of an idea which was developing in my head. But as soon as my still life idea struck, I realised that the combination of collected objects on a somewhat surreal deserted background would make for the perfect twist on the traditional still life composition. So as soon as we got back from Ronda, I started work. The objects I collected for my work were not really the result of coincidence. Rather, I carefully planned my selection so that I could achieve a colour balance within the two main colours of the palette chosen for this work: red and green. 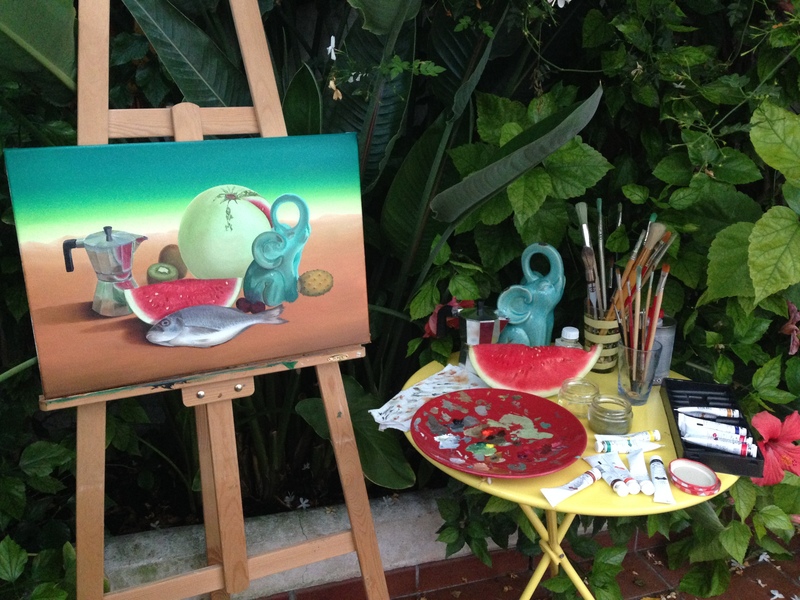 The ceramic elephant was already a feature of the garden in which I was doing my painting, and the various fruits were chosen specifically for their colour, shape and what they represented: the watermelon represents the global profile of Marbella; the elephant our time out on the terrace. The kiwis represent our constant furry travelling companions Fluffy and Bilbao, and the cactus fruits represent the extensive work we did on redecorating our Marbella terrace. The beautiful silvery sea bream represents all the pleasure we took in eating out; while the cherries represent my partner and I, never separated, coming as a pair. Finally the coffee pot is there in homage to Peinado who gave me the idea of a still life; and because coffee culture is surely one of the most enjoyable aspects of life in Marbella. 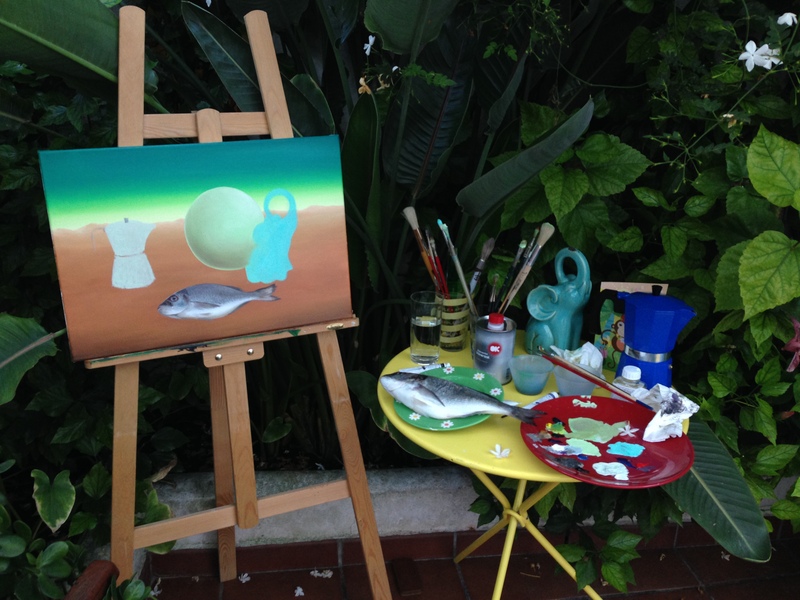 So after several days painting this work in instalments after visits to the beach, my first Still Life was complete. Now I’m hooked on the idea and can already imagine doing so many more. The question is, what will I paint in my next Still Life? While last week I shared with you one of my more sedate paintings of Barcelona – an oil landscape of the Port Vell – this week, as the tales of my recent Barcelona travels draw to a close, it’s inevitably time to share the second of my two paintings featuring Barcelona – and this time it’s a far more vibrant affair. Part III of my España Volver series, Separatism, explored the fragmentation and political division which is shared by two autonomous regions of Spain, the Basque Country and Catalunya (Catalonia), both of which have a historically fractious relationship with the Spanish nation to whom they are, for some unwittingly, part of a national whole. By way of demonstration of the political and social fragmentation which means that these two regions sit so uneasily with the rest of Spain, the symbols painted across my painting are framed in the shapes of a jigsaw puzzle which, rather than fitting together easily, is in part broken and displaced. 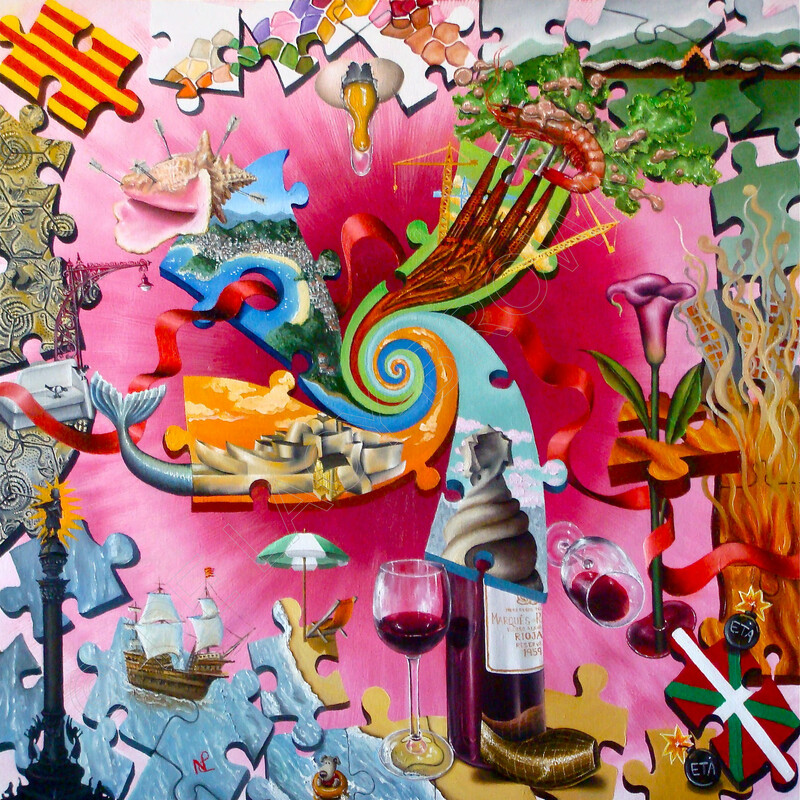 Emerging out of and contained within the pieces of the puzzle are a series of images representing the shared values and passions of the region – food, wine, art and maritime history, as well as icons that are unique to the regions. So out of the Basque Country comes Frank Gehry’s famous Guggenheim building, while in Barcelona, the capital of Catalunya, we have Gehry’s magnificent beachside Peix fish. Representing the Basque town of Saint Sebastian, I have painted a conch shell pierced by arrows (St. Seb’s bay is known as La Concha because of its curving shape), while Gaudi’s iconic Sagrada Familia takes centre stage in this painting, with a dual purpose as a fork on which a juicy salsa drizzled prawn is poised; symbol of the gastronomic prowess of both regions. Meanwhile, further reference to Catalunya’s artistic prowess is made in the broken egg, representing Catalunya born Salvador Dali, while around the canvas, various symbols of Gaudi are represented, from his Passeig de Gracia paving slabs on the left, to the Casa Mila chimney which emerges atop of a bottle of fine Rioja wine. Of course there’s violence too, with an illustration of the ETA bombings over on the right; symbol of the violent means which some separatist idealist have gone to to make their point, as well as the spiralling energetic core of the painting – a further demonstration of the plethora of cultural, social and historical influences which have made the regions as richly divergent as they are today. And for those of you who would like to see this painting closer at hand, it will be on exhibition, along with the rest of my España Volver series at London’s Strand Gallery between 13-18 May. More details can be found here.